Have you ever heard of slabbed coins? A lot of people hear about these but may not know what to imagine — perhaps a coin stuck in a good old hunk of concrete? Is it a coin slathered in a block of butter? Is it a coin seared in a nice Porterhouse steak? Sounds silly perhaps, but unless you know coin collecting vernacular, you are forgiven if those images initially ran through your head. Slabbed coins, in coin-collecting terminology, refers to coins sealed in clear plastic containers bearing the opinions of professionals working at a coin-grading service relating to authenticity and condition. 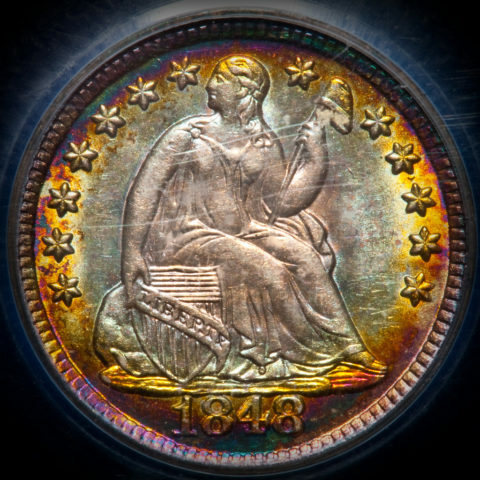 Slabbed coins are highly sought after and often controversial. Slabbed coins are often expensive, high-grade, and frequently rare. They are the type of coin many of the serious big-spending collectors and investors go after. The reason slabbed coins are so sought after by some is the fact that they represent a ‘safe’ buy. The person buying a slabbed coin can have some type of idea as to what to expect when buying a slabbed coin. The prospective buyer knows the coin is authentic and accurately graded (usually). One can buy such coins with a high degree of confidence even in sight-unseen transactions like mail-order and online auctions. Third-party coin graders (which are the independent firms that do the coin grading and the slabbing) have been around now for a few decades — and some have built pretty good reputations. Those are also 4 of the top companies of the 12 or so prominent groups that grade and slab coins. Each service has separate submission policies, and some do not allow private individuals who are not coin professionals to submit coins directly to them. Check out each company’s policy to see which may be best for you. Coin grading services generally range from $10 to $30 per coin, and some may not encapsulate your coin if it is cleaned, damaged, or otherwise deemed unfit for slabbing. They do, however, grade coins in all wear-based states of preservation, including low ball coins. Third-party coin grading, however, is not perfect, nor is it foolproof. Some people say that certain companies have conservative grading standards (grading lower than some think a coin deserves) and believe others have looser standards (assigning a grade that seems a little too flattering to a coin). Some coins will be graded by a company, broken out of its slab, and later resubmitted to the same company only to receive a higher or lower grade than first assigned. It is also highly common for some coins to be broken out of one company’s slab and then be resubmitted elsewhere, in the hopes of it receiving a higher grade. Sometimes this happens, or it might get a lower grade — or it may receive the same grade. Some unscrupulous individuals have even tried to tamper with these coin holders to alter the coins inside, trade them out before selling them, and the like.